First, I want to thank you guys for the amazing response on the Restaurant Style Paneer Butter Masala recipe.You guys have been the best! 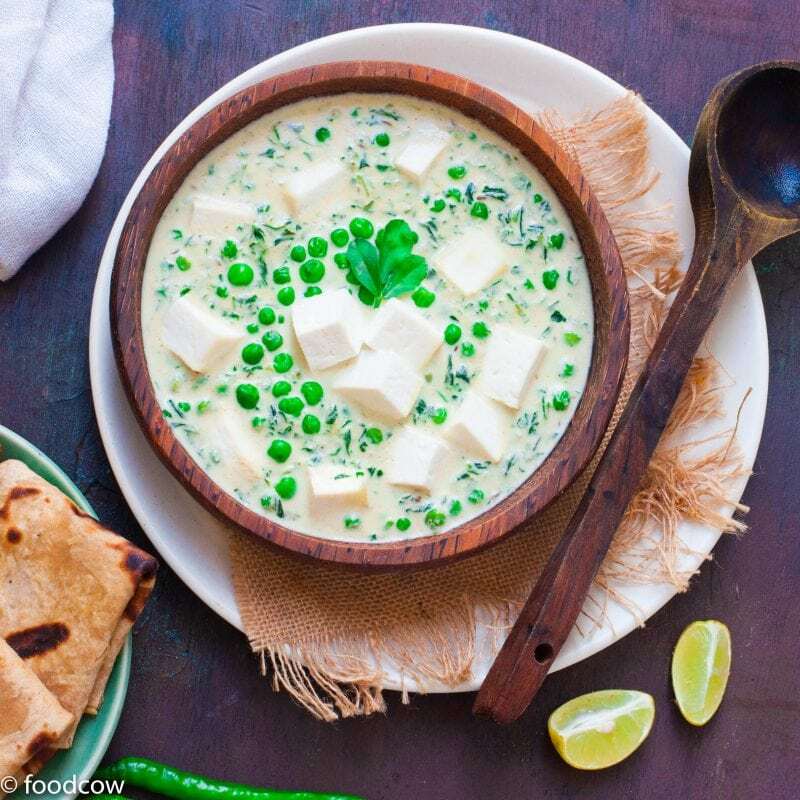 A lot of you have asked for more Paneer(cottage cheese) recipes and here is another one of my favourites – Methi Malai Matar Paneer. For me Methi( Fenugreek) and matar(fresh Peas) always signify winter.Even though both of these vegetables are easily available throughout the year now, at-least in bangalore, they still evoke the memories of chilly delhi winters. If you read the recipe you will see that the ingredients list isn’t very long.In fact, it barely has any spices.The flavour comes from the fresh green chilli and the ginger and off course the fresh fenugreek leaves which has a very characteristic slightly sweet,nutty and bitter flavour. This is one of the simpler paneer recipes- there is no complex mix of masalas or time consuming sautéing involved.I would categorise it as a beginners paneer recipe. Methi malai matar paneer is made with fresh fenugreek or methi leaves. The leaves will need to be washed several times to remove any dirt and mud.I usually run them under flowing water three to four times. You can use fresh or frozen peas but if they are in season do use fresh peas. To make this gravy vegan- substitute the dairy products- cream and milk with cashew milk and cream instaed. The same gravy can be used just by itself without any paneer or with mushrooms or corn. It’s difficult to find good paneer but there are tricks to make any hard old(as long as its not bad) paneer soft. The trick is to – always soak it in warm water with a tsp of vinegar for 20 minutes. Also!! to store paneer for longer- Cut it up and store it in a covered box with water and 1 tsp of vinegar in the refrigerator.This method ensures soft and fresh paneer for about a week and sometimes more!! Wash the Methi leaves.Sprinkle a tsp of salt and set aside. Puree the onions,cashews,Khas Khas,ginger and green Chilli together with a tbsp of water. Heat the oil/Ghee in a pan and add the jeera.Once it splutters, add the onion puree and cook for about 5-10 minutes. Squeeze the excess water out of the methi leaves and add to the cooked onion puree.Add the peas and Continue to cook and sauté for 5-10 minutes. Sprinkle in the coriander powder.Add the milk and cream the methi and matar toghether for additional 5 minutes. Pour in the cream next.Bring to boil and switch off the heat.Add the cubed paneer last. Garnish with coriander and serve hot with parathas or rice.